Lit. stepping stones. As the key material for the path of the *roji 露地 or tea garden, they are essential to the function of the garden and a key component of its aesthetic design. Depending on the style of the tea master or garden designer, tobi-ishi are said to be 60 percent practical and 40 percent scenic, or 40 percent practical and 60 percent scenic. The arrangement of the stones controls the pace as one proceeds through the garden and sets the mood, whether formal, semiformal or informal. 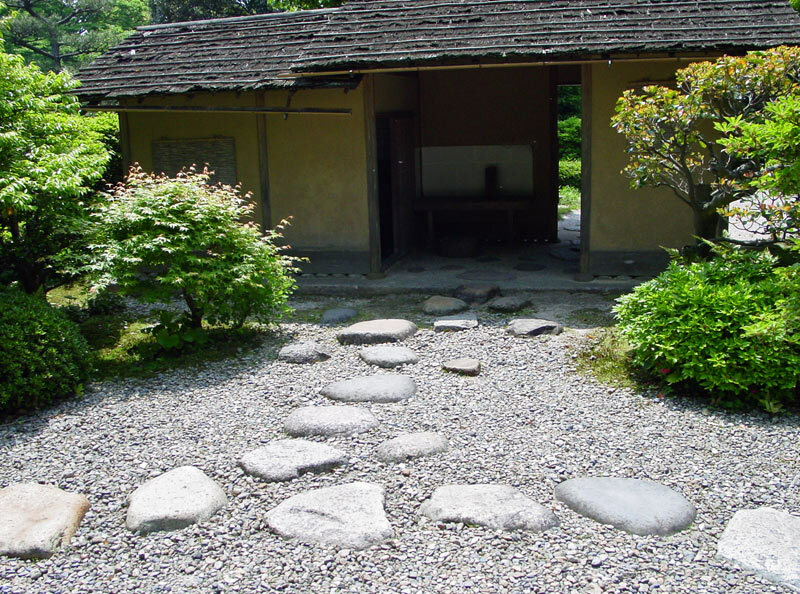 Stepping stones may also be called nori-no-ishi 乗の石 with the implication that they show the guests where to go. Trump stones or *yaku-ishi 役石 are also used to highlight the prominent features of the garden scenery. The first trump stone is the *fumi-ishi 踏石 placed by the guest's entrance to the *chashitsu 茶室, another by the katanakake 刀掛 (sword rack), others by the *chiriana 塵穴, *tsukubai 蹲踞, *sunasetchin 砂雪隠, *koshikake machiai 腰掛待合, and *chuumon 中門 or *nakakuguri 中潜. It is generally thought that tobi-ishi came to be used from the time of Sen Rikyuu 千利休 (1522-91), who supposedly used stepping stones in roji where moss or dirt path was likely to be muddy after rain. There are many ways of arranging stepping stones; the most common being the chokuuchi 直打 (straight line), niren'uchi 二連打 (two stone set), sanren'uchi 三連打 (three stone set), *goren'uchi 五連打 (a five stone set) made up of the former two types, shichi-go-san 七五三 (seven, five, three stone pattern), shisankuzushi 四三崩 (a three and four stone set) in a zig-zag pattern *chidorigake 千鳥掛 an alternate stone zig-zag pattern *gan'uchi 雁打 (the flying geese or extended zig-zag pattern), konohauchi 木の葉打 (fallen leaves), and tanzakuuchi 短冊打 (the oblong stone set). Tobi-ishi are generally 6 cm. from the ground in the Rikyuu style, 5 cm. in the Oribe 織部 style, and only 3cm. in the Enshuu 遠州 style. The *fumiwake-ishi 踏分石 or stone used at an intersection of paths is usually a little larger and taller than other stones. Commonly used stone types include *kurama-ishi 鞍馬石 and *kamogawa-ishi 賀茂川石 from Kyoto, Koushuu 甲州 stone from Yamanashi prefecture, *nebukawa-ishi 根府川石 and Sagami 相模 stone from Kanagawa prefecture and Tsukuba 筑波 stone from Ibaraki prefecture. There are many tobi-ishi in roji preserved from the Edo period, but few from the Momoyama period. Gardens of several Momoyama period roji such as the Myouki'an 妙喜庵 Tai'an 待庵 in Yamasaki 山崎, Kan'in-no-seki 閑隠の席 at Jukouin 聚光院 and Shoukouken 松向軒 at Koutouin 高桐院 of Daitokuji 大徳寺 were all added after the original construction. The tobi-ishi of the Gepparou 月波楼 at Katsura Rikyuu 桂離宮, Kyoto, are perhaps the oldest extent stones in a roji.